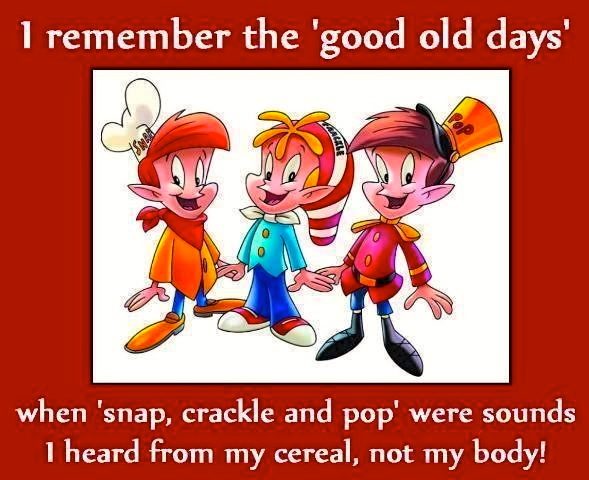 Listen to the fairy song of health, the merry chorus sung by Kellogg’s Rice Krispies as they merrily snap, crackle and pop in a bowl of milk. If you’ve never heard food talking, now is your chance. 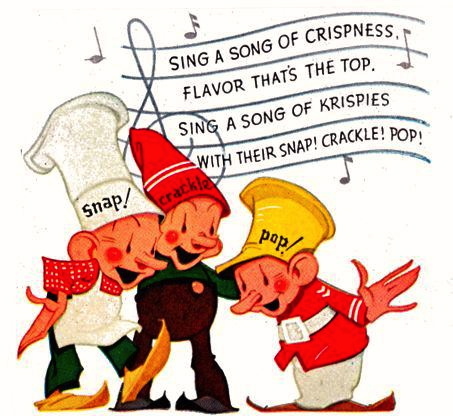 The first character appeared on the product’s packaging in 1933, Grant added two more and named the trio Snap, Crackle and Pop. Snap is always portrayed with a baker’s hat and Pop with the military cap of a marching band leader. Crackle’s red or striped stocking cap leaves his occupation ambiguous. Corporate promotional material describes their personalities as resembling brothers. Snap is the oldest and a problem solver, Crackle is an unsure “middle child” and Pop is a mischievous youngster. Denmark – Pif! Paf! Puf! Finland – Riks! Raks! Poks! France – Cric! Crac! Croc! Germany – Knisper! Knasper! Knusper! Switzerland – Piff! Paff! Poff! Quebec – Cric! Crac! Croc! Mexico – Pim! Pum! Pam! In most of these, only the vowel varies, generally moving from high front to low back (that is, with descending second formant), from “small-sounding” to “large-sounding”. This entry was posted on July 10, 2013 at 4:17 am and is filed under Language in advertising, Phonology, Sound symbolism, Syntax. You can follow any responses to this entry through the RSS 2.0 feed. You can leave a response, or trackback from your own site.